"I TOLD YOU I AM NOT GOING IN THERE!" OOC: Correct, Captain Hook will get to ask the Cheshire Cat a question when the Cat makes his next appearance in the game. It will be obvious when that is, but I'll also indicate when during an OOC post. Just so you know, the question can be asked in or out of character, but it will be answered in the game, by Cheshire (and he might not know everything). The group see's a light down at the end of the hallway, and begins to make their way down to investigate. As they get closer and closer to the light, they notice that the light is actually coming from the elevator, the haunted elevator. Scar is going on about not wanting to get into the thing. Stitch wonders why the lights are only on in the elevator, if the ride had been shut down due to technical issues. Stitch giggles a bit when he thinks about this and Captain Hooks earlier remark and gesture. Just what exactly are they looking for? Not being a ride expert, there is no way Stitch would be able to tell why the ride has stopped working. OOC: I think there is some confusion to the chronological events after Belle gets in the library, probably stemming from me as posting from my phone is long and tedious. Keep in mind, the service elevator is at the end of the boiler room, and the one in the lobby leads to nowwhere, literally in on and off stage terms. I've went ahead and fixed mine to go along with everyone elses post up to the last one. Though it may now be best to go with 5titch's account since we're on a new page now. *Back in the Tower of Terror gift shop, Kuzco is getting more than a little anxious. He can't get through on that phone call and he hasn't heard anything from the two teams of detectives searching both attractions. He knows he said that he'd supervise the teams, but it's pouring rain and if he goes out now he'd ... shudder ... get soaked. And then he'd be cold and miserable for the rest of the night because they still have dinner reservations at the Brown Derby and he'd have to go in his cold, damp clothes if he went out in this weather. To relieve his frustration and give him something to do, he starts to pace ... and notices that there is an entrance - or is it an exit? - that seems to head in the direction of the Tower of Terror ... .
OOC: I think there is some confusion to the chronological events after Belle gets in the library, probably stemming from me as posting from my phone is long and tedious. 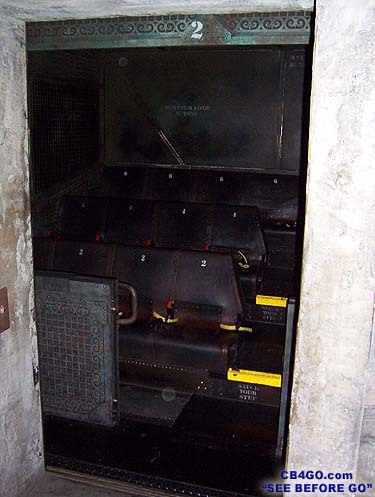 Keep in mind, the service elevator is at the end of the boiler room, and the one in the lobby leads to nowwhere, literally in on and off stage terms. Anyway, its probably best we stick to 5titch's account since we're on a new page now. The detectives approach the elevator while Scar was still protesting- his claws out and his teeth bared. Belle steps into the elevator and glances around. Belle heard the lion bellow outside and looked back at him with her hands on her hips, "Sir, with all due respect considering the experience you have in this work, I believe- being that we are detectives - when we are assigned to search an attraction that is malfunctioning, that it's our job to detect thoroughly what's happening!" "If you want to get killed, librarian, than after you!" Scar hissed. "I'll be waiting out here to let the others know where your 'investigating skills' led you." "Now dear, I don't think any harm lies in wait on those elevators," Ursula tried to reason to Scar. Belle rolled her eyes and muttered 'scaredy-cat... literally,' under her breath before she walked into the elevator. "I'm going in, and anyone else who wants to can feel free to join me." *With the elevator shaft left ajar, Belle bravely sits down intending to go up ahead and investigate what may lie ahead. She even taunts her beloved, calling him a "scardey cat." While she's annoyed at the bimbette for the comment, she see's her reasoning behind the suggestion. She then decides to go with another means of persuasion. "Scar Darling, you know as well as I do that's in eveyone's besnterest to stay togegher and investigate." The sea witch then sits down on the front row, "the emeeithgency exit is right behind you," pointing to the now unlit area. "You're more than welcome to wait with Kuzco in the gift shop..."
*OOC: Oh sorry... For some reason, calling it an elevator SHAFT made me think it was an open shaft with no elevator in it. Belle watches as Ursula coos to Scar, "Scar Darling, you know as well as I do that it's in everyone's best interest to stay together and investigate." She sits down and shoots a dirty look at Belle (I assume she heard my remark, Belle thought with a sigh), before she finishes talking to Scar. "You're more than welcome to wait with Kuzco in the gift shop." "Well, blast it all, I'm not afraid of a little elevator!" Hook huffed. "Nothing nearly scary about this aside from the decor," Edna agreed. The two walked in and sat in Belle's row. Diablo cawed and entered along with Stitch. Scar's eyes never left Ursula as the other detectives were finding their seats. Belle could not tell whether or not Scar conquered his fears as the lights flickered off and the doors quickly closed afterwards. The ride had begun. Diablo flutters into the elevator car and grips one of the handrails on the back of a seat very tightly with his talons. There's no telling what might happen. He caws nervously. You are the passengers on a most uncommon elevator about to ascend into your very own episode of The Twilight Zone. Belle haphazardly listens to the announcer as she looks around the attraction, trying to decipher what was causing the malfunction that Kuzco had spoken of. She looks ahead and sees the eerie pretend ghosts of the 5 'elevator passengers'. While normally she would tighten her grip on her prince's arm and smile, due to the circumstances she was intent to keep focus and observe the scenes to make sure nothing was off about them. Belle jumped suddenly at a prick to her arm and sighed in relief when she realized it was just the Captain's hook accidentally nudging her, who seemed a bit more jittery about elevators than he had let on before. She looked over at him and he muttered an apology as Edna patted his arm on the other side of him. One stormy night long ago, five people stepped through the door of an elevator and into a nightmare. That door is opening once again, and this time, it's opening for you. The elevator rises with these cryptic words and then begins to move horizontally as normal. Just as it is about to get to the actual shaft of the elevator ('almost time for those blasted sudden drops' as hook put it in a nervous loud whisper to Edna)... the ride stops. "Did anyone else see that?" Belle asked, finding it unusually strange as the attraction was off. She looked over and noticed Stitch partly closing her eyes. "Well Captain, maybe you"- she stopped when she saw Hook's eyes completely shut and sighed. "Never mind." Hook opened his eyes and looked around before he cleared his throat and straightened in his seat, "Just a brief moment of confusion there..." Edna nodded at him sympathetically before she stood up nonchalantly, not shaken in the slightest. "Clearly we've found the malfunction," Ursula noted, going over to the doors to open them. "Ursula," Belle asked as the other detectives got their bearings and rose from their seats as well. "Is it safe to open the elevator doors at this point?" Ursula looked at Belle as she simply opened the doors, without any consequence. Belle sighed, noting the sea sorceresses attitude must have been in the name of her 'beloved'. She steps next to Ursula and looks down, and is surprised at what she sees... one of the elevators seems to have crashed for real. Belle looked over at Ursula, "Ursula, do you think you can call Scar and ask him to manually lift our elevator and the one down there? Can he handle that"
Ursula scoffed, "Can he? Scar can handle anything." She picks up her phone and quickly dials the lion. "Hello sweetie... yes, yes I'm fine- no, nothing bad happened... Scar!! Listen, I need you to go to the control room and manually work the controls. No- no, I'm not hurt. But we may have found what caused the malfunctions for the ride. I know- I know you aren't normally like this... alright goodbye." Ursula hung up and all eyes were on her. She looked at Belle with a terse smile, "Never fear when Scar is on the case." Diablo cawed, with what Belle took as a hint of sarcasm. She nodded at him in a way to say she couldn't agree more. As soon as Scar raised the elevators, he went straight to Ursula and made sure she was okay. The detectives then made their way down through the cast access passages to unloading area and see what the crashed elevator had uncovered. Belle was first to walk in and covered her mouth at what she saw. Mad Madam Mim was dead and crushed, with a very peaceful expression on her face. Hook followed in shortly after Belle and noted Mad Madam Mim's expression. "Now isn't that rather ironic? You'd think she would look mad..."
Belle patted Hook's arm as he dealt with the awkward silence yet again from another 'boot in mouth' expression, and with a sigh pulled out her iPhone to help document yet another crime scene. Dr. Doofen shmirtz has followed Aurora, Merlin and Tinkerbell down the coaster tracks. It is dark, but Heinz can see the tiny pixie avoiding him. suddenly Aurora stops and he bumps into her. " I wish you would get some brakelights." Aurora points something out in the dark....or someone rather. When he moves closer and with a little light he sees it is a person, a very dead person. Upon closer examination he can't tell the cause of death, but he does notice something. DR DOOFENSHMIRTZ..." Hey everyone look ot this Wendy Darling has been tied to the tracks with a LENGTH OF ROPE. I will bag it for the lab.....hold on wait a minute I'm not wearing gloves...who has gloves?" Merlin hand Doofenshmirtz a pair of gloves and then he bags the evidence. OOC* The ROPE is an official clue...also I know this a game we are competing against each, but is there anyone that can list or send me a list of all the clues. Between being a single father with twins and work, i am just keeping up with the post count and have kind of lost the clues. I will probably never figure it out anyway, but it would be more fun just to know. Tink watches as dr doof bags a piece of rope and said the victim was tied down, she was able to hear that it was a female and small but no more than that! tink tries to look but is blocked from doig so until the body is draped. But then tink gets a look at the hair and shoes sticking out and realises why everyone is looking at her oddly. it was Wendy girl!!!! tink sits down in shock , she is still upset even thought that minx tried to steal peters heart from her! Than it comes to her! they may think she did it, They think that I killed wendy! Tink tries to tell them that she didnt do it but they seem not to listen to her . tink backs away in disbelief. ps - Stef your doing an awesome job with this game keep it up! After the discovery of Madam Mim's body, with a quite unusual happy expression on it, Stitch can not help but wonder what it was she was doing up to the point of her death. Was she aware that she was about to die? OOC: I will change Ariel to VIP, but I give the same warning that I did with Kida; the 72 hour rule post will apply. VIP just means not required to make a post count. You still will have to post at least once every 72 hours or Ariel will be eligible to be killed off. OOC: I'm heading off for work. I will update the game whenever I can. If I can't get on during the day, I will when I get home. Don't leave the park, we are going to the Brown Derby following the two crime scenes. *Scar continues to flatly refuse to be pushed or dragged into the elevator.He is a little concerned as Ursala decides to go. This almost changes his mind but before he can enter the door closes and the ride begins. It isnt long before he gets a phone call and is asked to raise the elevators manually. With a sigh of relief he is just happy to hear Ursulas voice and that she is ok. Of course he does what she asked. Ooc..ok that should get me back wih the group. Tink texts the other group at the tower to let them know of wendys demise and being tied to the tracks with a rope which was being bagged and tagged already. she waits to hear back of the othe groups findings. she gets back to the scene photographing and fingerprinting the tracks hoping to find the killers prints.